Relax your feet or take a seat. 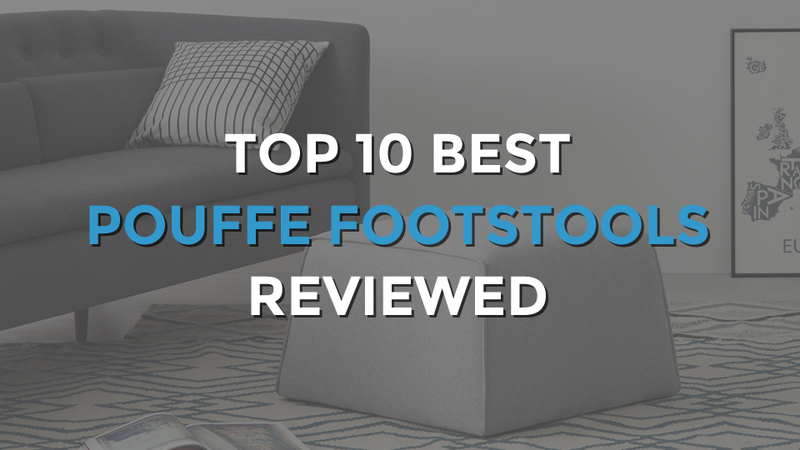 Space saving, easily movable and cool looking, our top 10 best pouffe footstools provides a relaxing footrest or seat, while giving a finishing touch to a room. 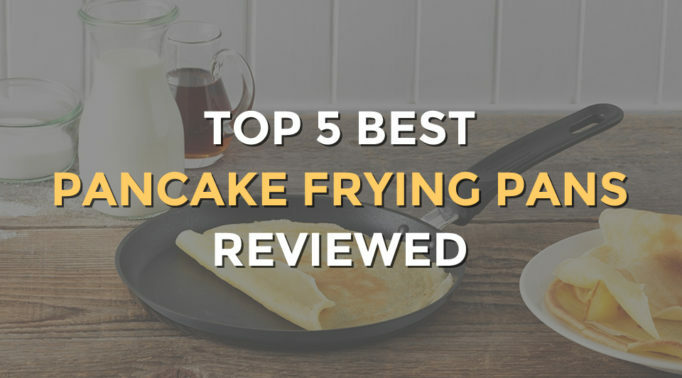 You’ll be surprised of how useful it is to have these around your home. Braided and hand knitted with 100% cotton yarn, the EHC Braided Pouffe Cushion has a comforting homely feel to its design. Filled with expanded polysterene inside, the cushion is firm and keeps its shape well which makes it great for sitting on too. With its height at 14 inches tall, it’s the perfect height to rest your feet on and will level with many standard sized armchairs and sofas. The overall size isn’t too big which makes it a good size for smaller rooms. 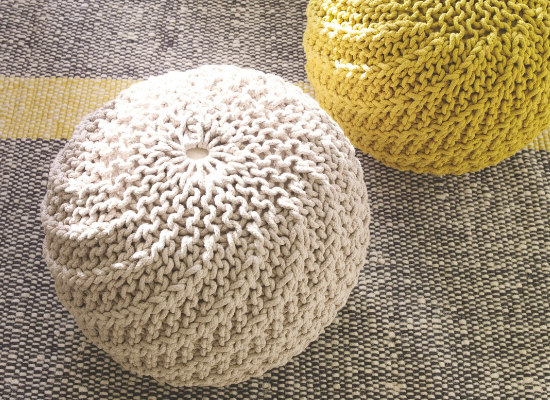 Due to its chunky knit design, it would look great in a craft store or room too. It’s available in nine colours including red, turquoise and mustard yellow. Made from 100% super soft stonewashed cotton, the Fatboy Point Stonewashed Stool is a trendy and versatile footstool that’s easy to clean. The smooth fabric can be easily wiped clean with a damp cloth or with water and soap which will dry well without damaging or marking the fabric. With its flat surface, the Fatboy stool can be used as a handy side table and as a comfortable stool to sit on. In addition to putting your feet up on, of course. It has a weight of 1.85kg, which gives it a strong and sturdy feel. 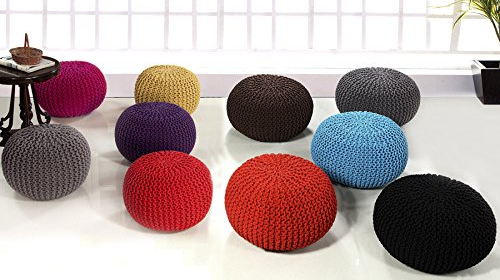 There are 11 colours to choose from, making it one of the best pouffe footstools for variety. Textured with a baroque style pattern, the Habitat Durrie footstool gives great comfort without losing out on the quality and design. Shaped as a square, this footstool maintains its shape well over time. Being flat, it works well as a side table without the need to place a tray or something flat on top. With a monochrome diamond pattern and red wave pattern design to choose from, it gives off a flair of the retro look that’s eye catching and quirky. Looking like a giant marshmallow, the Ikea Stockholm Pouffe is covered in the soft and plush fabric that’s known as velvet. This makes it super comfy for your bare feet to rest on as well as a great seat. 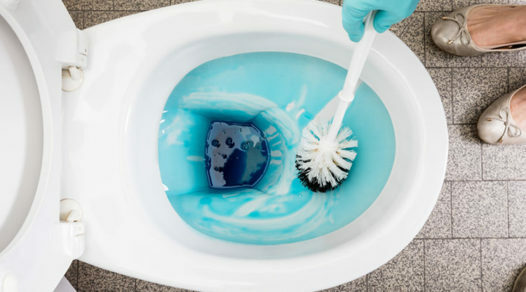 It’s easier to clean than most pouffe footstools as well; it can be cleaned with the soft brush attachment on the vacuum cleaner. The size is relatively small at 42cm high with a 50cm diameter and it’s light which makes it easy to move around. It will fit nicely in a small room and comes in dark blue, grey and orange. 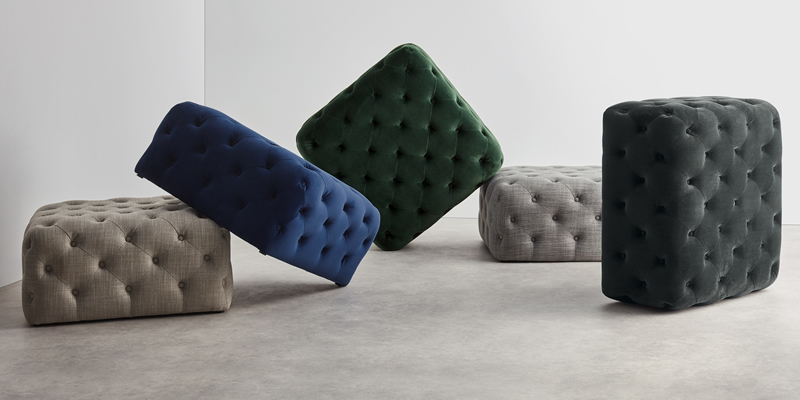 Shorter than most pouffe footstools, the Made Tova footstool measures 40cm in height. Having a footstool at this height is ideal for someone who is shorter or for anyone who doesn’t want to elevate their feet that high. Of course, it will suit lower seated sofas and armchairs too. Made from a soft grey two tone weave fabric, this helps to create a seamless finish on the footstool. It gives the footstool an overall smooth look which goes well with its unique shape. Due to its large size, it’s wide enough to allow two people to use the footstool together. Handcrafted and in an ethical partnership with a family in Marrakech, the Bohemia Round Moroccan Pouffes come in a large range of bespoke patterns and colours. There are designs of intricate gold foil patterns on black leather or beautiful solid colours of indigo blue. Each pouffe design is one of a kind and eye catching. 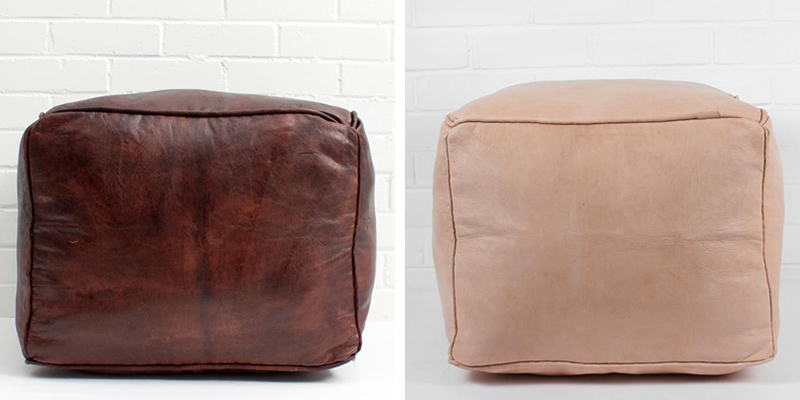 All are constructed from faux or real leather material that’s of a high quality and helps the pouffe to keep its round shape. They can come stuffed with filling or without if you prefer to stuff it with your own choice of filling through the discrete zip on the underside. They’re not overly big with their 30cm height and 53cm diameter and gives instant style to any room. 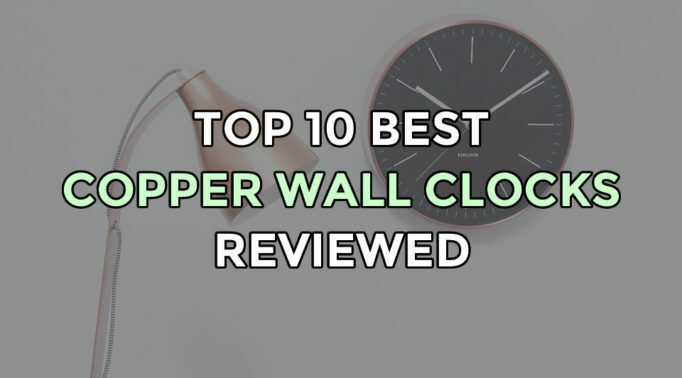 Some designs make a great bold statement piece as well. The Bohemia Square Moroccan Pouffes are the same material as the brand’s round design, but this design is a square shaped pouffe instead. It measures 45 x 35cm which means it can be stood at either height to suit each different user. Each side is pretty flat so it provides a nice surface enabling it to be used as a side table too. Featuring a gorgeous royal blue colour, the Habitat Knot pouffe is handmade with a detailed and textured knit pattern cover. This material consists of 100% cord and lining which prevents the knitting from fraying or loosening. Filled with polystyrene balls, this footstool is sturdy yet light enabling it to be moved about easily. With its firmness, it provides plenty of comfort and support for your feet as it doesn’t sink into the pouffe. Made from linen, the Made Hampton footstool makes a cool and comforting base for your feet to relax on. Filled with foam, this pouffe footstool is super firm and weighs heavier than most pouffes which makes it extra sturdy. It’s a lot bigger too at 82cm in width and length so there’s lots of room for two people to prop their feet up. Designed with deep buttoning detail, it stands out from other pouffes and looks sophisticated which will fit in great in a stylish home. 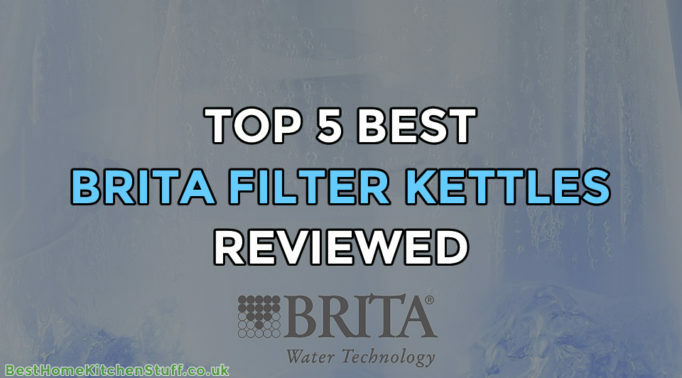 With its firmness and flat base, it also works well to place your cup of tea on or to use as an extra seat. It’s one of the more expensive pouffes but worth the price paid given its excellent quality and design. This Luxury Real Leather Footstool by Bean Bag Bazaar is filled with polystyrene balls which makes it more pliable and soft. Being just 28cm in height, it’s ideal for anyone who is looking to stretch their legs out without resting them too high. For some people, resting their feet too high can be uncomfortable on the back. 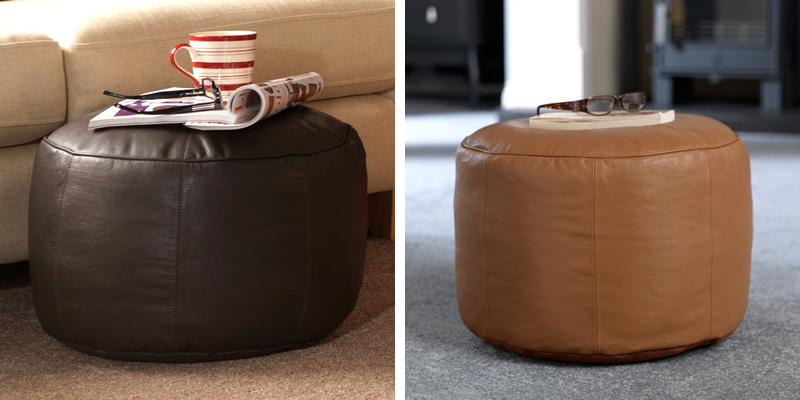 Available in black, brown and tan, this is the best pouffe footstool for providing value for money. Anyone after a more softer pouffe to sink their feet into or a smaller pouffe will simply make the most of it. Simple in design, this pouffe footstool by Bean Bag Bazaar is on the more affordable end of the scale, yet the quality is not compromised.